First Kicks is a specially designed programme for 3-6 year olds, and uses sports and physical activity to improve and develop agility, coordination, spatial awareness, and teamwork. As fun is at the heart of learning, we endeavour to excite and enthuse young children by engaging them in fun and games, while teaching them the basic skills of physical activity in an environment conducive to learning. Research has found that participating in sports can have a healthy developmental impact on young children. The activities that First Kicks provides promotes physical wellbeing, cooperative play, teamwork, and good sportsmanship while helping to refine gross motor skills. First Kicks brings together children from different background, and encourages friendships from an early age, thus laying the foundation for better communities. 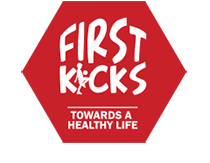 All First Kicks coaches are fully qualified, and are specially trained to work with very young children. Our coaches all hold enhanced CRB checks.